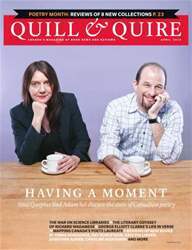 New Interactive Quill & Quire magazine designed exclusively for tablets. HAVING A MOMENT Sina Queyras and Adam Sol discuss the state of Canadian poetry. Plus reviews of new books by EMMA DONOGHUE, RAY ROBERTSON, KATE PULLINGER, JONATHAN AUXIER, CAROLINE ADDERSON, JASON GURIEL and more.